We love hiring the greatest boat around, Spirit of Darwin as a Darwin venue hire for all sorts of events like a million dollar sunset view on your Wedding day or a 21st birthday party's, Hens night's, kids discos you name it we have hired the boat out as a amazing all in one venue! We can help you transform the boat from Casual events right through to Formal Corporate events, Weddings & Birthdays. More information of the boat hire for a private charter on the Spirit of Darwin as below, please read carefully. All prices of private charters include captain and crew. Full license bar no BYO drinks. Sound system onboard to play your own music. PA and microphone for presentations. Easy parking and limited disable access onboard. Does not include food as you can have your own catering with a bar tab option available. please note does not include drinks and food. Deposit to secure cruise date. Please refer to our Terms & Conditions for Details. Wedding & business decor available or welcome to bring your own. Savory tart topped with Salami, feta cheese & olives. Cucumber slices with a homemade cheese blend of herbs finished with Tasmanian smoked salmon. Bocconcini and pesto toasts bites. On your tailored charter you can expect a warm welcome from the friendly Captain and Crew as you board the Spectacular “Spirit of Darwin.” We can arrange seating to suit your group or if you prefer an open dance floor we are flexible to meet all of your unique needs. You will enjoy your choice of menu options made from fresh local produce, the perfect accompaniment to the spectacular view! The friendly crew are ready and able to assist your every need; we are able to cater for up to 160 board even at full capacity the vessel is quite spacious while still retaining a spirited atmosphere! This unique experience allows you to choose your cruise length, decorations, food, drinks & even the Music. You are free to utilise the both of our decks; our climate controlled lower deck as well as our shaded open air top deck. A minimum deposit of 30% for charter fee is required; payment is accepted by credit card (2% fee), direct deposit or cash by arrangement. Deposit is non-refundable. Final numbers must be confirmed no later than 14 days prior to scheduled cruise date in writing; all charges apply to final numbers. Additional numbers after this time will be charged at agreed fees. 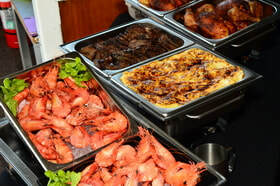 (iii) All catering options to be disclosed prior to cruise date. (iv) Self-catering using Spirit cook and or equipment additional fees apply. No later than 14 days prior to scheduled cruise date in writing, all charges apply to final numbers. Additional numbers after this time will be charged at agreed fees. (iv) Nominated person has sole authority to increase tab if required and responsible to finalise increased tab payment at conclusion of cruise. (v) Responsible service of alcohol guidelines strictly adhere, service will be refused on these grounds. No later than 14 days prior to scheduled cruise date, in the event a portion of the 50%of the bar tab is unspent no refund will be given. All decorating to be confirmed in writing no later than 14 days prior to scheduled cruise date. One hour prior to boarding cruise is available for decorating at no fee. Additional time can be arranged for decorating at $80 per hour or part thereof. (i) 14 days cancellation notice or less no refund. (ii) Spirit of Darwin reserves the sole rightto cancel cruise due to weather or other unforeseen circumstance.In this case alternative date will be offered were possible. (iii) Spirit of Darwin reserves the sole right to cancel and or shorten cruise duration due to behaviour,intoxication or non-compliance. Disembarking at the nearest location. The charterer shall be charged in respect of any loss, damage or excessive cleaning to the vessel or its equipment or fittings howsoever caused by members of the charterer’s group, fair cleaning, wear and tear accepted. Spirit of Darwin and crew take all care but no responsibility for any personal or commercial items brought aboard the vessel. The Charterer agrees to indemnify and hold harmless ‘Sprit of Darwin harbour Cruises’, its agents and employees, from and against any and all losses, claims, actions, costs, expenses, fees, damages, fines and liabilities (including reasonable legal fees) caused by any negligent act or omission by ‘Spirit of Darwin Harbour Cruises’ or members of the Charterer’s group. (v) Intoxication or the use of prohibited drugs. ‘Spirit of Darwin Harbour Cruises’ reserves the right to take any steps it deems necessary to ensure no alcohol is brought aboard the vessel. Security may be required at the request of ‘Spirit of Darwin Harbour cruises’ management at full cost to the Charterer.